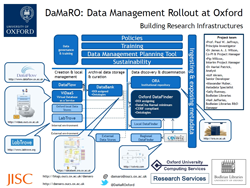 DaMaRO (Data Management Rollout at Oxford) is a collaborative project between several departments within the university: Oxford University Computing Services, the Bodleian Libraries, and Research Services. It is funded by JISC and will run until March 2013. The aim of the project is creating a research data management policy for the University and the infrastructure to enable researchers to comply with it. DaMaRO will take the outputs of the various research data management project that the University has been engaged in over the last few years and combines them into a better-integrated suite of tools and discovery mechanisms that will support researchers throughout the data life-cycle, from planning to re-use. Of particular note is the ‘DataFinder’ tool that DaMaRO will be developing. This will enable the discovery of data hosted in various places around the University and beyond. Behind the scenes, DataFinder will be able to automatically gather metadata from each of the tools and repositories it connects to, assign DOIs where they are not already assigned, and ensure that the metadata complies with the national DataCite standards. Furthermore, DataFinder will make the metadata it gathers available as linked data, and also map it to the CERIF standard, so that alerts can be issued to compatible research management systems when new project outputs are made available. Beside software development, the DaMaRO Project will develop data management trainings and documentations for researchers.